Greetings from The 88 Project! We are bringing you news, analysis, and actions regarding human rights and civil society in Vietnam during the week of September 10-16. On September 12, Brotherhood for Democracy member and environmental activist Nguyen Trung Truc was sentenced to 12 years in prison. Two days later, another member of the Brotherhood for Democracy, Nguyen Van Tuc, had his appeal of his 13-year sentence denied. Imprisoned pro-democracy leader Tran Huynh Duy Thuc ended his hunger strike after 34 days, and labor and environmental activist Hoang Duc Binh is having ear problems in prison. Online activist Huynh Truong Ca was arrested on September 4; Facebook users Ngo Van Dung and Xuan Hong were also detained in early September, but their whereabouts remain unknown. Truong Van Kim, a former political prisoner, was attacked by undercover police for the second time in recent months. This week, we highlight the case of Nguyen Van Duc Do, a handyman who was arrested because of alleged ties to a civil society group–he’s been in detention awaiting trial for almost two years. After one human rights defender was denied entry to Vietnam ahead of the World Economic Forum, Amnesty International’s Senior Director of Global Operations was also rejected. In the news, read about dissident singer Mai Khoi and the obstacles she faces to continue performing, as well as Vietnam’s call for Facebook to set up a local office. Coming up, two more peaceful activists face trial– citizen journalist Do Cong Duong on September 17 and former teacher Dao Quang Thuc on September 19. Please take action for Tran Thi Nga, calling on Vietnam to protect her from torture in prison. Nguyen Trung Truc was sentenced to 12 years in prison in Quang Binh province on September 12. His lawyer reported that Truc maintained his innocence and said he would appeal the verdict. Truc is a political and environmental activist who had advocated for multi-party democracy and support for affected communities after the 2016 Formosa environmental disaster. 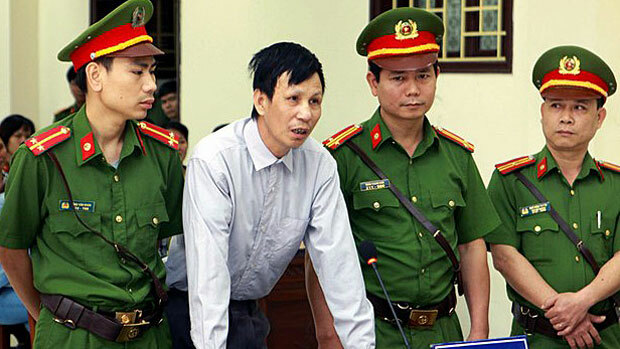 Amnesty International condemned the sentence, saying, “All Nguyen Trung Truc is guilty of is speaking out for human rights and advocating for democracy in Viet Nam,” and Human Rights Watch called him “yet another victim of the Vietnamese government’s campaign against people who advocate human rights and democracy.” The US Embassy in Vietnam also released a statement criticizing the decision. Nguyen Van Tuc‘s appeal of his 13-year sentence was denied on September 14. Tuc’s wife said that he saw the trial as an opportunity to voice his continued support for peaceful activism, and she noted that his health situation has been more stable recently. Human Rights Watch called for his release ahead of the appeal trial. Tuc was arrested under Article 79 of the 1999 Criminal Code on September 1, 2017 for ties to the Brotherhood for Democracy and for his human rights and maritime sovereignty activism. Imprisoned blogger and entrepreneur Tran Huynh Duy Thuc ended his hunger strike after 34 days. His family was allowed a brief visit with him on September 15, but was prohibited from “discussing outside news” with him. Thuc objected to this arbitrary prohibition and was taken away shortly after the visit started, and his family was also forced outside of the prison. They were allowed another brief visit with him on September 16, during which Thuc agreed with his family to end the hunger strike to maintain his health, but emphasized that he would continue to petition the authorities to respect the rule of law, not only in his own case, but also in others’. Environmental activist Hoang Duc Binh is suffering from ear pain in prison, he told his brother at a recent visit. He says the pain stems from his assault when he was arrested in May 2017. Binh has been facing extremely difficult conditions in prison, housed in a cell with death row prisoners and denied adequate nutrition. Binh is the vice president of the independent Viet Labour Movement, a member of “No-U Saigon,” and a well-known Catholic blogger. In February 2018, he was sentenced to 14 years in prison. Huynh Truong Ca was arrested on September 4 and is now possibly being charged with “making, storing, spreading information, materials, items for the purpose of opposing the State of the Socialist Republic of Vietnam” under Article 117 of the 2015 Penal Code. The online activist has been accused of posting content harmful to the government and calling for protests on social media. This week we remember Nguyen Van Duc Do on the occasion of his birthday on September 10. He is currently awaiting trial under Article 79 of the 1999 Criminal Code and has been in pre-trial detention for over 22 months. He was arrested in November 2016 after visiting his friend, and now also political prisoner, Luu Van Vinh. Vinh is the founder of the Coalition for Self-determined Vietnamese People, but had left the organization shortly before his arrest. Do was arrested for alleged ties to the group, which he denies, stating his only involvement is that of having a friendship with Vinh. Blogger and active Facebook user Ngo Van Dung was taken into custody on September 4. His situation remains unclear, and many fear he has been formally arrested. Authorities have not given information about his whereabouts. Facebook user Xuan Hong was allegedly detained in Ho Chi Minh City on September 2. Her family also does not know her whereabouts and has not received information on formal charges. Xuan Hong has a 30-month old daughter. Former political prisoner and land rights activist Truong Van Kim was once again attacked by plainclothes police this past week, who beat him while he was in transit between his farm and home. He had to be hospitalized afterwards. He had also been attacked in June 2018 and April 2017. Amnesty International’s Senior Director of Global Operations, Minar Pimple, has been denied entry into Vietnam to speak at the World Economic Forum. The International Federation for Human Rights also announced that Vietnam had denied entry of its Secretary General, Debbie Stothard, into the country. Some view the denials as an attempt to silence well-known voices who have long spoken out about political prisoners and human rights issues in the country. Land rights activist and citizen journalist Do Cong Duong will go to trial on September 17 on charges of “disturbing public order” under Article 318 of the 2015 Criminal Code, along with three others. He faces up to seven years in prison. He also faces separate charges of “abusing democratic freedoms.” Duong was arrested in January 2018 after filming a forced eviction. Former teacher Dao Quang Thuc will face trial on September 19 in Hoa Binh province. He was arrested in October 2017 on charges of subversion under Article 79 of the 1999 Criminal Code for online postings and peaceful participation in protests over the environment and territorial disputes with China. He was just recently permitted to meet with his lawyer, despite being in detention for almost one year. His family alleges he has been tortured while imprisoned.